I have a fondness for vampires. I love their lore, and imagining the different kind of lives each kind would live. Embarrassingly, I also admit that I love the dramatic romance of the vampire, even the dark stories. When I saw this shirt, I knew it had to join the collection. With the exception of the Sparkly One aka Edward (meh! ), I am pretty much a fan of them all. 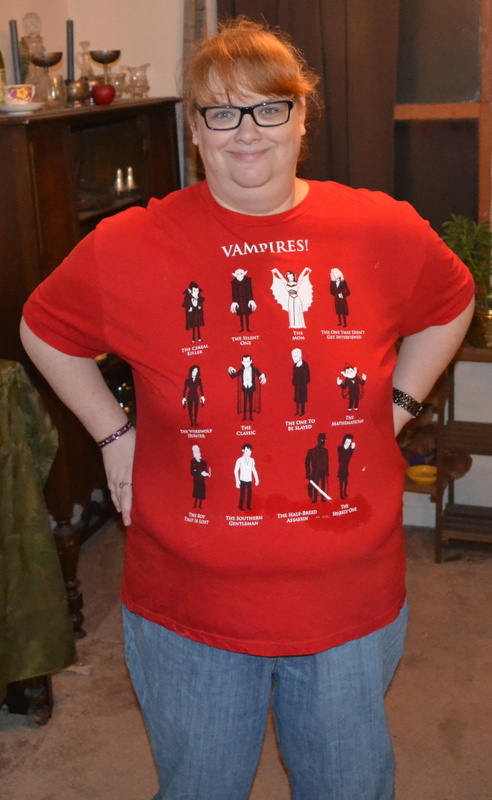 Blade, Lestat, Dracula, The Count, Bill the Vampire from True Blood, Bela Lugosi, Selene from Underworld, Spike from Buffy the Vampire Slayer, Count Chocula and Lily Munster (and the sparkly one) appear on the shirt. Awesome, right? I’m still trying to convince my gaming group to play a vampire game. Pretty please with sugar on top, guys?